A judge in Germany has indicated that Apple is unlikely to secure a ban on sales of the Samsung Galaxy Tab 10.1 for alleged patent infringement. Judge Johanna Brueckner-Hofman indicated at a hearing Thursday that it is unlikely that Samsung's redesigned Galaxy Tab 10.1N will be banned from sale, according to Bloomberg. The Dusseldorf court found that Samsung has changed the look of its touchscreen tablet enough to distance itself from Apple's iPad. "Consumers are well aware that there is an original and that competitors try to use similar designs, so buyers are vigilant when looking at products," the judge reportedly said. "We don't think that someone buys a Samsung to make his table neighbor at the coffee house believe he owns an iPad." A final ruling in the case has been set for Feb. 9. Apple's attorneys attempted to convince the court that that Samsung's Galaxy Tab 10.1 is "exploiting the reputation of the iPad." Samsung has suggested that Apple's lawsuits blocking the Galaxy Tab have boosted awareness of the device. 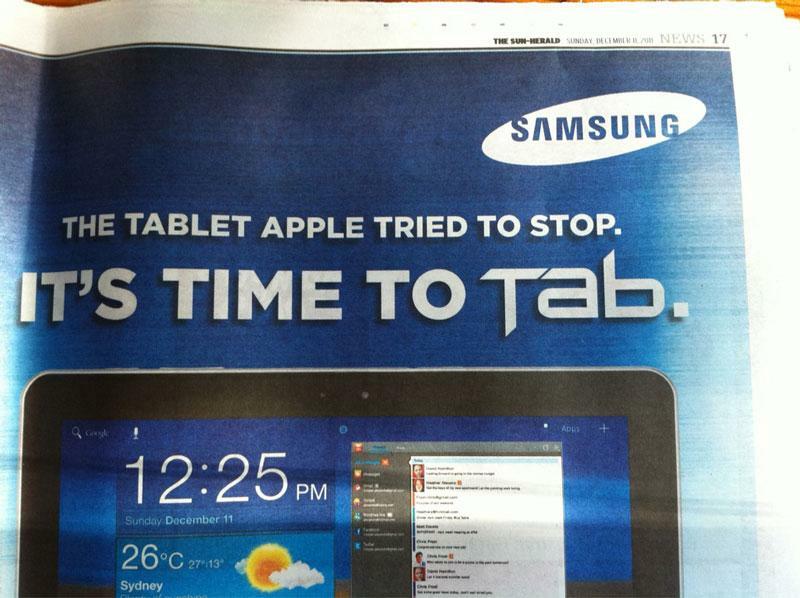 The company has even initiated an advertising campaign stating the device is "the tablet Apple tried to stop." Though Apple initially won a ban on the Galaxy Tab 10.1, Samsung redesigned the device and renamed it the Galaxy Tab 10.1N in an attempt to avoid patent infringement claims from Apple. The new tablet has thicker edges and speakers that accompany the front screen.